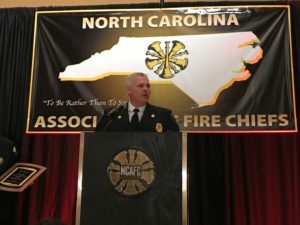 Battalion Chief Ronnie Boles was presented the Volunteer Fire Chief of the Year Award at the 2019 N.C. Association of Fire Chiefs Mid Winter Conference on February 2, 2019. Boles volunteers as the Fire Chief of East Bend Volunteer Fire Department in Yadkin County. He has been employed with the Town of Kernersville Fire Rescue Department for 18 years. He was recognized for his leadership of the East Bend Fire Department and efforts to improve the community fire insurance rating, training and equipment. Along with the fire department, Boles is very active in his church and volunteers his time to help with mission projects and youth sports.